I forget how crazy busy summer gets until Friday rolls around and we haven’t shot or even discussed Dish of the Week. Last Saturday I found myself shooting it guerrilla style in the middle of the hot line during a busy dinner service which had come hard on the heels of a wedding in the gallery. More than my nerves got singed. So when I drifted into the kitchen on Wed morning and saw Lou Preston had just dropped off a box of the most beautiful strawberries anyone had seen in a long time, Chef and I jumped on the idea of a super quick summer salad that would star these glorious babies, grown in some of the most loved soil in the county at the height of their season. We momentarily toyed with the idea of just putting them in a bowl and calling it a day but that begged the question of why berries, especially strawberries, are often just so much better on their own. The truth is they don’t mix well with proteins, or most vegetables, which is why they are almost always relegated to the desert column. There’s nothing wrong with a natural sweet food profile but it needs a foil to stop it going flat on you after the first few bites. Chef used the strawberries themselves to provide this counterpoint by compressing half of them in verbena, which took most of the sugar out, replacing it with a nice soury kick and a woody floral aroma. Not quite pickled, a step before fermented. 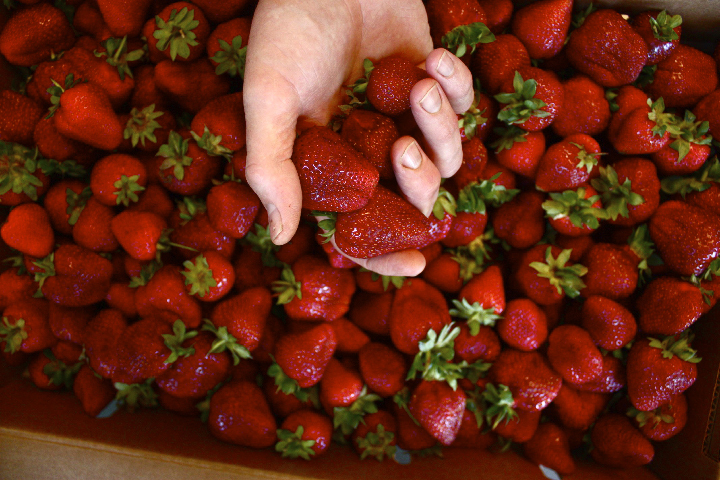 The process of compressing the strawberries deepened their color to a bruised red which saturated the berry all the way through, creating a nice confusion between the brain, expecting sweet, and the taste, which was uniquely savory. 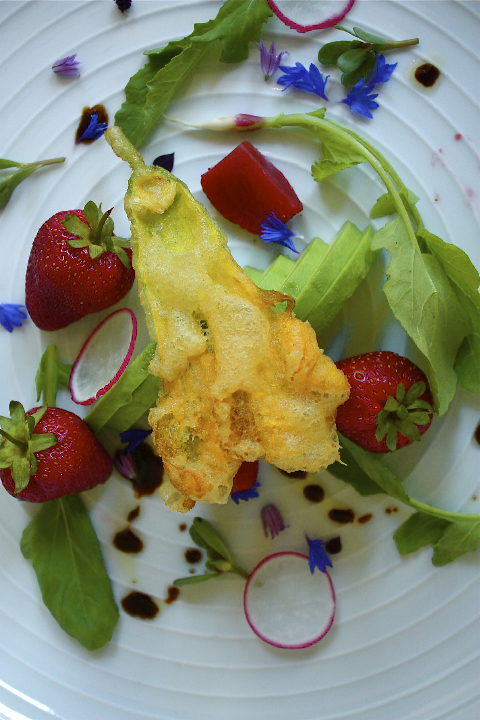 Edible flowers, with their delicate shapes, colors and earthy taste profiles, were a natural bridge between this Janus-like strawberry presentation and the other ingredients: the purslane, the gentle heat provided by the arugula and the radishes, the creaminess of the avocado and the great crunch of the tempura squash blossom. We are particularly proud of the bachelor buttons, which we grew from seed here at the Barn. I thought vibrant saffron Calendula petals would have been a nice touch as well, but Chef demurred ~ he was on a groove with his muted color palette. 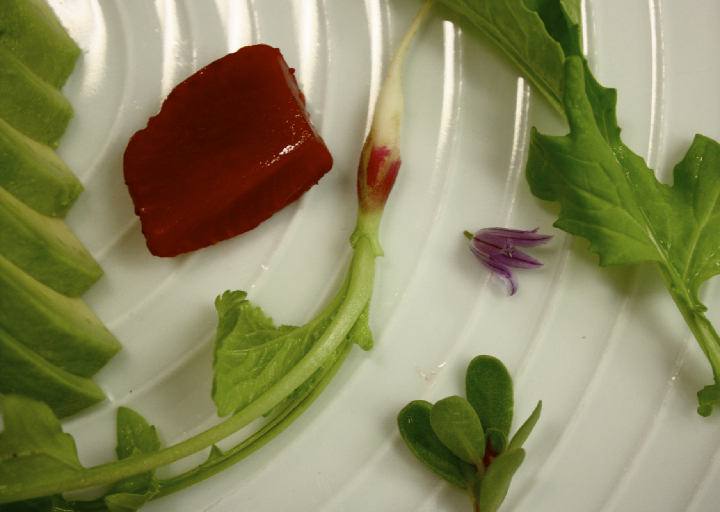 All this attention to detail isn't just about taste, and the tiny petals are a case in point: most chefs in the middle of a hectic service would have just sprinkled them on, but that wouldn't satisfy Ryan's belief that we eat with our eyes first. No matter how involved you are in conversation when you're dining out and a plate arrives there's always a moment when you pick up your fork and look down. The eye really does luxuriate in color and form and the result of Ryan's artistry in that moment~ brief as it may be ~ has the effect of slowing everything down. A few days ago Sandra Jordan dropped off a precious allotment of her exceptional balsamic which Chef used as Morse code on the plate, instead of dressing the salad. Jordan’s balsamic is a thing of wonder, not cheap mind you, but like everything this classy lady does (her exquisite alpaca fabric line, sandrajordan.com, is now sold worldwide), worth every penny. We use it sparingly to finish dishes ~ it’s so full flavored it even works with desserts ~ and the bar uses it in Sandra’s Ballsey, a sparkling cocktail we created for Sandra because, well, she is. Whatever it takes. 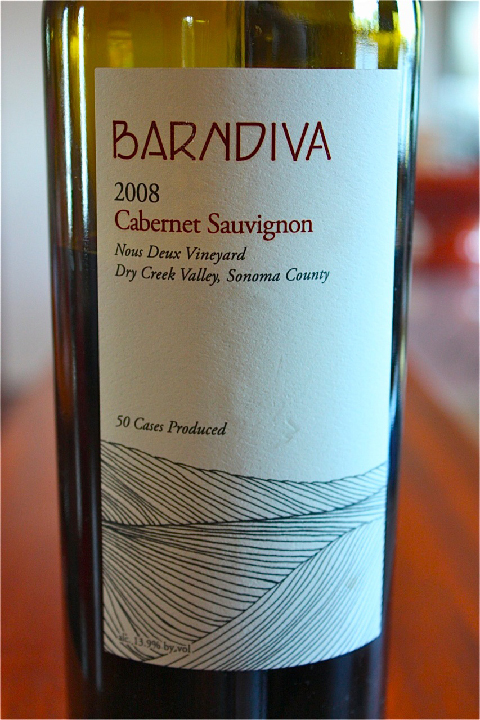 We’ve gotten a lot of offers over the years from winemakers who want to collaborate with us on a Barndiva label wine. And we’ve been tempted, boy have we been tempted. But we suffer from this particular disease ~ passionitis controleria ~ which strikes whenever we put our name on something. And wine, most especially, is not to be trifled with around here. 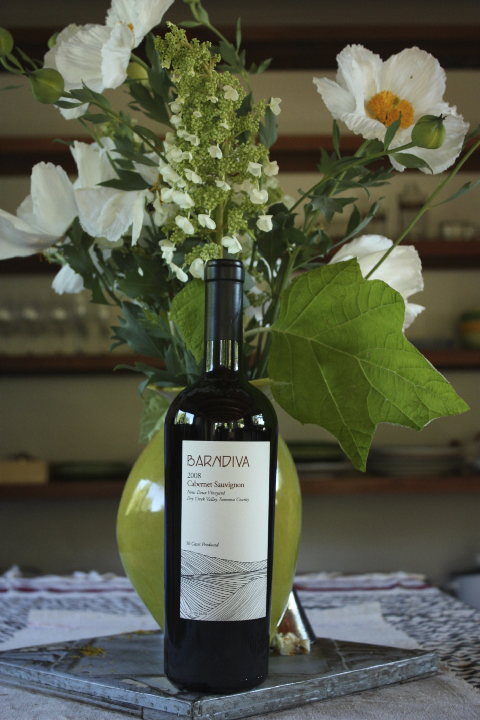 There is one winemaker we have believed in so much our own label Cabernet is all but a standing order. Dan Fitzgerald was a very young winemaker when we met him a few months after opening Barndiva when he came to tend bar. We saw character twinned with talent which was remarkable. He was just finishing school, after some years working in vineyards in France. Through his tenure at Williams Selyem until he landed at Pellegrini, where he is now head winemaker, we have been proud (but not surprised) at his progress in this most competitive industry. In partnership he now has his own collection of wines under the Ellipsis label ~ which dad Chris markets (stepmom Honor Comfort is the power behind Taste of Sonoma) but the wine he makes for Barndiva is a singular accomplishment. The grapes are grown exclusively in the Fitzgerald's 55 year old Deux Amis vineyard, which sits behind their beautiful home on West Dry Creek. A true vin de terroir made the way they made wine 200 years ago, grapes are handpicked and fermented with wild indigenous yeast from the grapes, hand pressed in a basket press in six tiny loads. 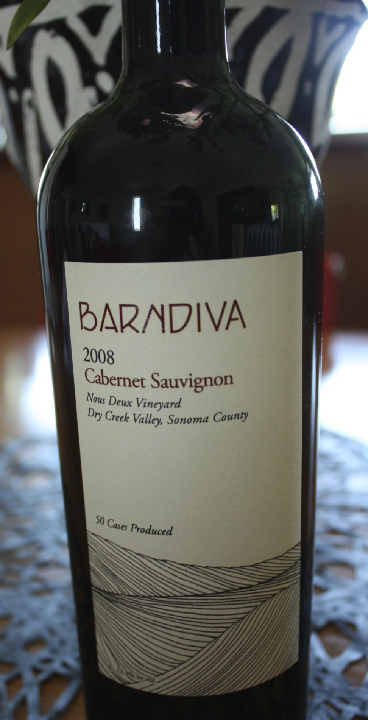 Aged in neutral oak for two years, this is a cabernet made in an elegant old world European style. It has an extraordinary ruby running to purple color that speaks of rich black and red fruit, which you get instantly from the nose, along with a hint of green that rises like mist from the berry patch. Tommy says there is a slight intimation of cigar box in the nose, and that he gets lots of fresh acidity framed by oak in the 2008, which we all agree is the finest vintage yet. This is more than Barndiva’s house wine, it’s a family collaboration even down to the label, which was designed by Geoffrey's goddaughter Elly and her talented mate Charlie who, like Dan, have risen to the top of their profession in London in only a few short years. Love the wine, love the story, worth the wait. 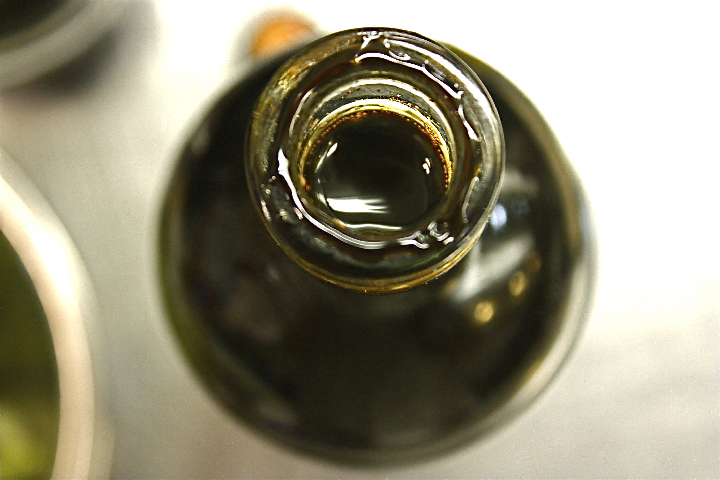 By the glass and by the bottle, while it lasts. Final words this week: check out the ‘new’ Tractor Bar Trio soon. 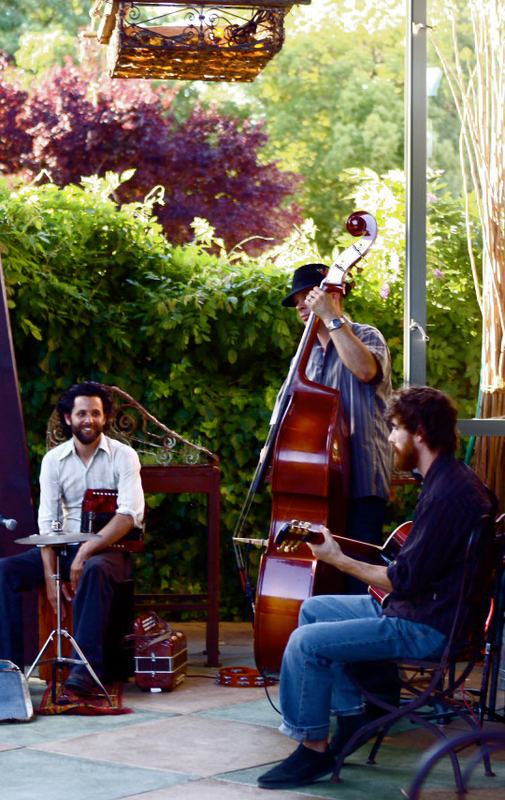 Last Wednesday they played two extremely mellow sets in the garden and it was Gypsy Jazz at its finest, folks. We are now serving lunch and dinner in the rear gardens throughout the week, weather permitting, but be warned, the summer's already flying by. Catch it. Sylvie Gil, one of Barndiva's favorite photographers, recently posted a few pictures of a Barndiva wedding- Congratulations Sarah and Ted! Click here to enjoy.